American Progressive metal band BETWEEN THE BURIED AND ME have confirmed a full European headline tour for the fall! The tour will kick off in Southampton in the UK on the 22nd of September and will bring the band to ten countries in total. Support comes from Haken. 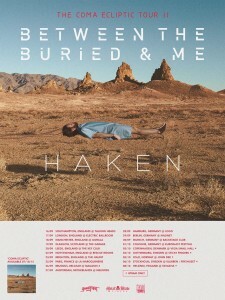 BETWEEN THE BURIED AND ME have just recently released a brand new song from their upcoming highly anticipated, seventh full-length album ”Coma Ecliptic”. Fans can listen to “Memory Palace” now by heading to metalblade.com/btbam. The upcoming album is also now available for pre-order with special bundles and packages offered, including: CD+DVD incl. an exclusive hour long behind the scenes making-of DVD, CD, DLP and two t-shirts. ”Coma Ecliptic” will be officially released worldwide on July 10th, 2015. Grandiose, dynamic, heavy, melodic, technically challenging and more, this album delivers. ”Coma Ecliptic” was recorded in January and February of 2015 with BETWEEN THE BURIED AND ME producer Jamie King at Basement Recordings in North Carolina. Drums and piano were recorded with King and Kris Hilbert at the Fidelitorium. Final mixing and mastering was placed in the capable hands of Jens Bogren (Opeth, Katatonia, Amon Amarth, Devin Townsend) at Fascination Street Studios in Sweden. BETWEEN THE BURIED AND ME began their journey in the year 2000 in North Carolina. Over the past 15 years, they have released seven full-length albums, an EP, a live album, a covers album, and a blu-ray/DVD. Their current lineup has been consistent since 2005, and they have taken full advantage of a stable and productive group of musicians. Each of their albums since that year have debuted on the Billboard Top 200 chart: Alaska (2005) at #121, The Anatomy Of (2006) at #151, Colors (2007) at #57, The Great Misdirect (2009) at #36, The Parallax: Hypersleep Dialogues EP (2011) at #54, and The Parallax: Future Sequence (2012) at #22. Additionally, the band’s first-ever Blu-ray release, Future Sequence: Live at the Fidelitorium debuted at #2 on the Billboard Top Music Video Charts, impressively ahead of video releases from progressive legends Dream Theater and YES. Consistency and growth in an epoch of shrinking music sales is indicative of the supreme impact the band has had across the heavy and progressive music landscapes. The band is composed of vocalist/keyboardist Tommy Rogers, guitarist Paul Waggoner, guitar Dustie Waring, bassist Dan Briggs and dummer Blake Richardson.